It is a mixture of style, ambience and health, paired with a wonderful mountain scenery, which allows you to spend unforgettable days in the Braunhörnle apartment. On our homepage you will find more information about special service offers like the filled refrigerator. Living in a Holz100 holiday home is an experience plus the wonderful view of the surrounding mountain world from the window. The fresh Black Forest air, the smell of meadows of herbs. Live in a modern wooden ambience - sleep in the soft scent of Swiss stone pine. Your holidays by us are more than just a few days without work and every-day stress. Lean back, do nothing - or relax while active. Whatever you want, you will find time for the most important things in life. Discover the freedom to design your holiday with the pressure of time. We offer different services for this like the 'filled fridge' or our very special gastronomy services. Until 3:00 PM, you can order by telephone from the menu from our partner operation in the Gasthaus Rössle in Elzach. The Rössle kitchen team will deliver the menu directly to your ZeiTraum holiday apartment - culinary pampering in a ZeiTraum manner. A small overview of our apartment Braunhörnle. We actually build beautiful houses for families. 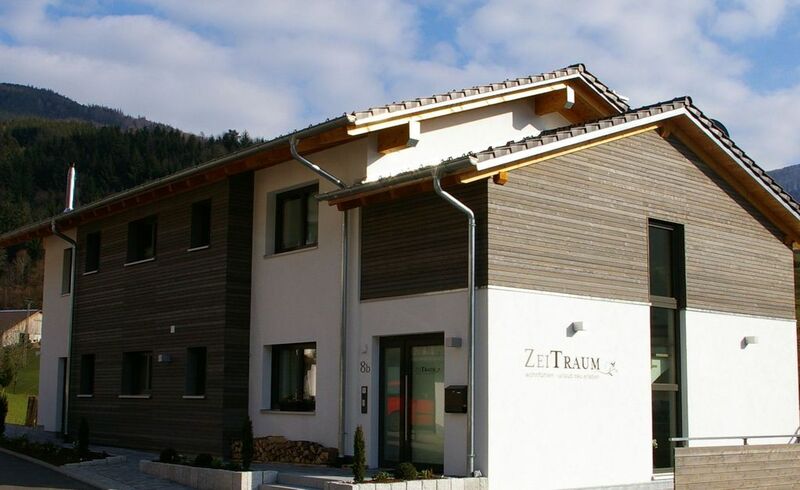 We, two brothers with a small construction company in Elzach-Yach, had the vision about three years ago to create something that had never existed. A new type of holiday. That was the birth of ZeiTraum. Who are we? Christian and Wolfgang Burger as well as Petra and Christian Burger. We were born here in Yach and grew up here and found the way back to our home after education and studies. Sometimes there are coincidences or situations that cannot be easily or soberly justified. Thus, we had the decision to create a nature holiday home in Yach. We love the nature and value the people who this is important for. Your holiday by us should become your very own personal DREAM. Just as we like to experience the best days and weeks in the year, now we offer this to our guests as well. And that is why we built this house. With attention to detail and a love for nature. For relaxation that is more sustainable and 'relaxing'. Our completely new, uniform concept. - Health in holiday - Holiday without any time pressure - Services as you know from good hotels - chef catering, wellness, beauty, whirlpool, swim-spa and a lot more. You will find what our guests say about their holiday in our guestbook. The bathrooms are barrier-free, have modern walk-in showers with rain dance and a vanity with storage space. Already upon entering your holiday apartment, you will feel how natural components and purely massive wood walls distinguish the climate and how the indescribable room atmosphere has an evening and soft effect on you . lean back, relax. Enjoy the ZEITRAUM feeling of our very special holiday apartment. If this is not enough, you can go into our wellness and spa area with unforgettable holidays in the middle of an amazing natural landscape in the beautiful Yachtal. Although it was difficult to find, we arrived on a late saturday afternoon to a warm welcome.It seems that most shops are closed on saturdays and we were a little late for lunch, but our host made arrangements for us to go to a nearby hotel for a late lunch.We also found a supermarket nearby which was open. Had we arrived on a Sunday, we would not have been so lucky. The apartment was immaculate and very well designed. The two bedrooms had their own bathrooms and the balcony afforded a wonderful view of the forest. The spa and pool were great - we used them every day. We also booked massages for the whole group one rainy afternoon, which were very good. The sisters who run this property are very helpful and spoke english very well. It would be good to provide fans on request as there was one incredibly hot night where it was very difficult to sleep even with all the windows open. An hour to Freiburg by car and half an hour to Triberg. Highly recommended. Erholung pur über den Jahreswechsel! Un lieu et un accueil très chaleureux, week-end très ressourçant ! Nous avons passé un excellent séjour dans un cadre magnifique, les hôtes sont au petits soins, nous reviendrons, c'est sûr ! Wonderful place, so quiet and beautiful. Lovely to relax in the hot tub in the evening and wake with a swim in the swim spa. Wir waren mit unserem Stammtisch (8.Personen) in diesem wunderschönem Feriendomizil,war alles wie im Traum,super schöne Wohnungen,ganz toller Wellnessbereich mit Außenpool und Whirlpool,ganz nette Gastgeber. Kommen ganz bestimmt wieder nach Yach um Erholsame Tage zu haben! Located on the western slopes of the Black Forest, you can enjoy the nearly Mediterranean climate of the Breisgau in Elzach-Yach in the Two Valley Land, but you can also enjoy the fresh mountain climate of the Black Forest slopes. Despite the close proximity to the nature, the infrastructural connections are very good - it is just 25 minutes by car to Freiburg. There are connections to public transportation of course. Yach, located in the Southern Black Forest nature park, is a small gem in the middle of the German traffic and street network. We are proud of being one of the largest natural landscapes in Germany that is not crossed with main streets. The biological standards used in the stylish wooden construction, peaceful tranquillity and movement and sport in our beautiful natural landscape. These are the ideal ingredients for sustainable relaxation and wellness that you will feel. Whether on foot on the countless hiking paths, with the mountain bike or the racing bike in the surrounding slopes and valleys - everyone will find something for their own taste and their athletic, but also cultural needs. In order to round off everything, you can also use our year-round heated outdoor swim-spa with a counter-current pool or our whirlpool as well as the comfortable warmth of our sauna. Our home offers countless options for activities. From several golf courses, paragliding starting spots, climbing options and rivers for canoes to a large cultural selection up to zoos and recreational parks, in particular Europapark which is only about a 40 minute drive away, the Two Valley Land offers all options of unique holidays. Look forward to very special holidays - we look forward to seeing you. Die Preise dieser Wohnung liegen je nach Saison und Verweildauer zwischen 35 € und 76 € pro Person und Nacht. Bitte teilen Sie den Wochenpreis nicht durch 7 Tage, da wir für Kurzurlaube Zuschläge berechnen. Ebenfalls gibt es Langzeitabschläge. Alle Preisangaben in Euro, inkl. Endreinigung und gesetzlicher MWSt, sowie auf Basis der Mindestbelegung von 4 Personen. Weitere Personen pro Nacht: bis 10 Jahren frei ab 10 - 15 Jahren 10,00 Euro ab 16 Jahren 20,00 Euro Die Weihnachts- und Silvesterwochen, sowie in den Sommerferien sind jeweils nur für mindestens eine ganze Woche buchbar.